Teleport to Podex office in your grid and pay the orange terminal (see the picture above) the amount of virtual money which you want to exchange. Please mind that minimum amount to sell is 1000 coins. After successful payment you will see a blue pop-up with the link to Podex web page. Click to open it in your web browser. You should see Podex web page with two options. Choose the first one because you want to send money to your PayPal account. Follow to the next page. Now you are asked for your PayPal account address and the currency in which we will send you money.. Fill in the fields and send the form. Be careful when you write your PayPal email – if you make a mistake somebody else will get your money. We will send you funds as soon as possible but the transaction can take up to four business days. After money is sent you will receive email notification from Paypal. 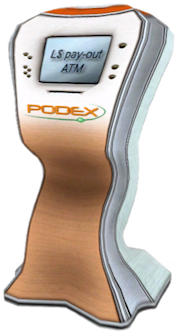 New clients of Podex are limited to withdraw not more than 150 USD (or equivalent in other currency) per 7 days. After one month the limit can be increased. If you want to know how much money you will receive use our exchange rate calculator. The final amount can be different because of Paypal fees.